An easily accessible guide to scientific information, Hazardous Chemicals: Safety Management and Global Regulations covers proper management, precautions, and related global regulations on the safety management of chemical substances. The book helps workers and safety personnel prevent and minimize the consequences of catastrophic releases of toxic, reactive, flammable, or explosive chemical substances, which often result in toxic or explosive hazards. It also details safety measures for transportation of chemical substances by different routes, such as by road, rail, air, and sea. The author discusses the importance of knowledge in avoiding negligence during the use and handling of hazardous chemical substances. He stresses the importance of proper management and judicious application of each chemical substance irrespective of the workplace and eventually shows how safety and protection of the user, workplace, and the living environment can be achieved. "This book is mainly a listing of the hazardous properties and commercial uses for several hundred common chemicals. ... the format appears to be quite useful ... information is presented as readily understandable blocks of text, rather than just numeric values. ... Summing Up: Recommended." "The power of this book is the consistent summary of the hazards and advice on reducing exposures to a wide range of chemicals. ... Students, chemical safety officials, and industrial hygiene professionals will find this book extremely useful. Dr. Dikshith has patiently distilled the critical health and safety information on hundreds of chemicals found in the workplace. 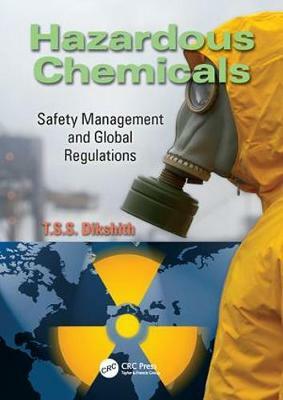 Dr. Dikshith has met the challenge of assembling chemical health and safety information that is too often scattered across multiple sources into a practical volume that many will find helpful."